Last week, beleaguered Illinois Comptroller Leslie Geissler Munger admitted that, thanks to the bitter budget battle going on in Springfield, the state would miss a $560 million pension payment in November. The news came as no surprise to those who have followed the story. A state Supreme Court decision in May effectively ruled out pension reform (it's the whole "implicit contract" argument) prompting Moody's to cut Chicago to junk and thrusting the state's financial crisis into the national spotlight. As we noted when the news hit, despite hiring an "all star" budget guru (for $30,000 a month no less), governor Bruce Rauner has been unable to pass a budget in a timely fashion leading directly to all types of absurdities including everything from the possibility of shortened school years to lottery winners being paid in IOUs. Now, Fitch has cut the state's GO rating citing the budget impasse. The move affects some $27 billion in debt. Still no word on when lottery winners can trade in their Rauner bucks for real cash. Fitch Ratings has downgraded the rating on $26.8 billion in outstanding Illinois general obligation (GO) bonds to 'BBB+' from 'A-'. In addition, the ratings on bonds related to the state based on its appropriation have been downgraded to 'BBB' from 'BBB+' as detailed at the end of this release. The Rating Outlook has been revised to Stable from Negative. REDUCED FLEXIBILITY: The downgrade reflects the continued deterioration of the state's financial flexibility during its extended budget impasse. Illinois's inability to balance its operations, eliminate accumulated liabilities, and grow reserves during a period of economic expansion leaves it far more vulnerable to the next economic downturn. ONGOING BUDGET GAPS: After four years of nominally balanced operations that benefitted from temporary tax increases, the fiscal 2015 budget was only balanced through extensive one-time action and a budget has not been enacted for fiscal 2016, which began on July 1. The state continues to spend in most areas at the fiscal 2015 rate, which is expected to lead to a sizeable deficit. As was the case during the most recent recession, this deficit spending is likely to be addressed by deferring state payments and increasing accumulated liabilities. LONG TERM LIABILITIES HIGH: The state's debt burden is above average and unfunded pension liabilities are exceptionally high. The state has limited flexibility with regard to pension obligations following the May 2015 Illinois Supreme Court decision that found the 2013 pension reform unconstitutional. Pensions remain an acute pressure on the state's fiscal operations. ECONOMY A CREDIT STRENGTH BUT RECOVERY WEAK: The state benefits from a large, diverse economy centered on the Chicago metropolitan area, which is the nation's third largest and is a nationally important business and transportation center. Economic growth through the current expansion has lagged that of the U.S. as a whole. The Stable Outlook incorporates the expectation that the state of Illinois will use one-time solutions to nominally balance the fiscal 2016 budget, but will not achieve more permanent, structural solutions in a time frame that will have a significant impact on fiscal 2016. Failure to enact measures that lead to ongoing budget balance beyond fiscal 2016 could lead to negative rating action. Successful implementation of measures to enact a structurally balanced budget and reduce accumulated budget liabilities may lead to positive rating action. 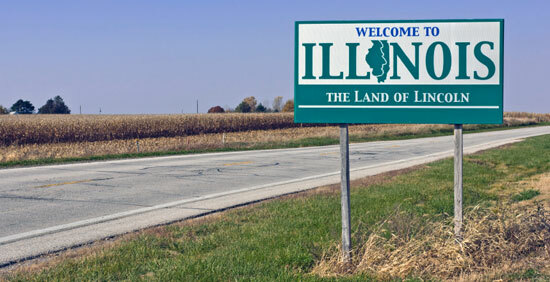 The downgrade on the GO bonds of the state of Illinois to 'BBB+' from 'A-' reflects the deterioration of the state's financial flexibility as its budget stalemate continues deep into the current fiscal year. 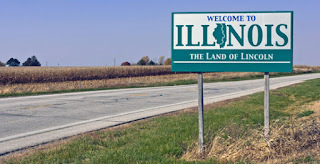 With the national economic expansion now extending into a sixth year, Illinois has failed to capitalize on economic growth to restore flexibility utilized during the last recession or to find a solution to its chronic mismatch of revenues and expenditures. Once again, the state has displayed an unwillingness to address numerous fiscal challenges, which are now again increasing in magnitude as a result. Temporary increases in personal and corporate income tax rates in place for four years, from January 1, 2011 through December 31, 2014, closed or partially closed the budget gap across five fiscal years. However, with their expiration, and the failure to enact a spending plan within expected revenues, the budget gap has ballooned. As a result, the state finds itself with a current operating deficit, structural budget deficit, cash crunch that is now causing a delay in pension system contributions, and accumulation of accounts payable that approaches its highest level at the depth of the recession. As the fiscal year progresses, fewer options remain for closing the gap on a current year basis, pushing the potential solutions into fiscal 2017. The current budget stalemate follows a fiscal 2015 when a significant gap was closed primarily through the use of one-time fund sweeps rather than on-going spending or revenue action. The enacted budget for fiscal 2015 relied on approximately $2 billion in one-time revenues to achieve balance, given the anticipated expiration of the temporary taxes half-way through the fiscal year. These included interfund borrowing, use of prior year surplus to prepay fiscal 2015 Medicaid expenses, underfunding of specific budget line-items, and an increase in anticipated accounts payable. Upon taking office in January 2015, and finding a budget gap that was larger than expected, the current administration proposed, and the legislature enacted, an additional $1.3 billion in fund sweeps and approximately $300 million in budget reductions. However, the lack of a structural solution in fiscal 2015 left the state in a weak fiscal position in developing the fiscal 2016 budget. The governor and state legislature have not come to agreement on a spending and revenue plan for the current fiscal year, which began July 1, 2015, for which there is a large projected deficit that reflects the full-year impact of the temporary tax expirations. Despite the absence of an enacted budget, due to continuing and permanent appropriations, court orders and consent decrees, and an enacted appropriation for schools, the state is spending approximately 85% of its budget at the fiscal 2015 enacted rate during the budget impasse. Continuing to spend at this rate, without further appropriations or other changes, is forecast to lead to an annual operating deficit of approximately $2.1 billion, or 6.8% of forecast revenues. This deficit would most likely be addressed by an increase to the accumulated accounts payable balance. Fitch believes that this deficit figure is likely to be higher, as it incorporates the state withholding $5.9 billion in spending for universities, the group health insurance program, and a variety of other programs, some of which would ultimately have to be covered with state revenue. The state notes that it has already taken approximately $1 billion in actions to reduce spending and reallocate funds to the general fund.